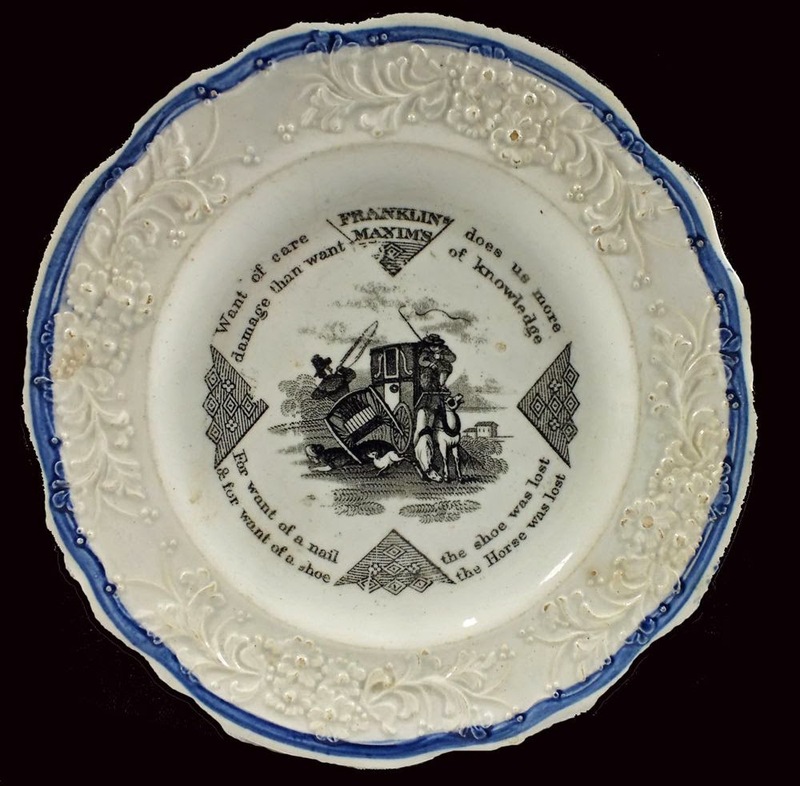 Child's 7 inch plate "Experience keeps a dear school/But fools will learn in no other." 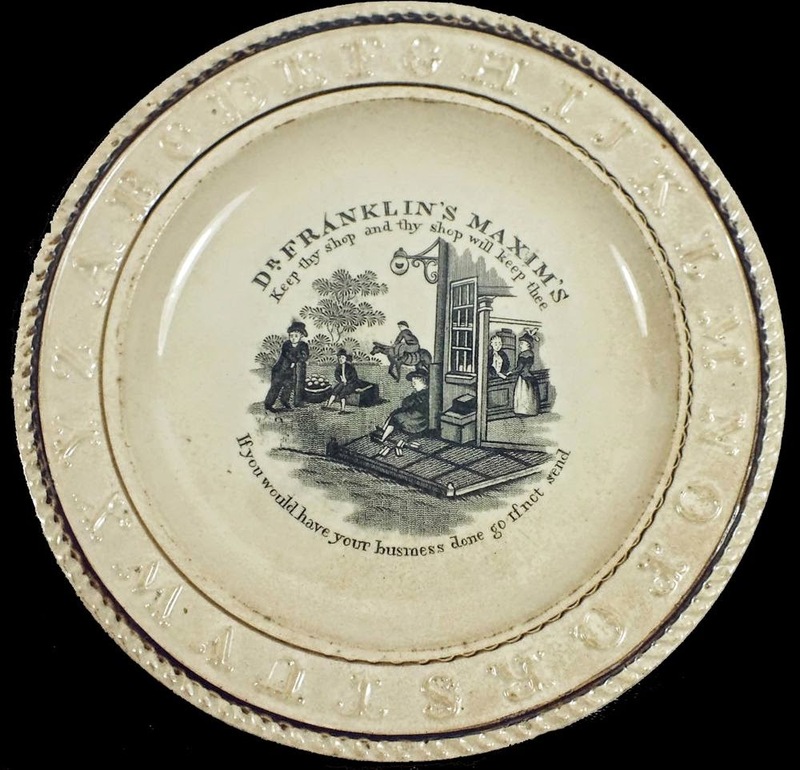 Benjamin Franklin is famous for lots of maxims (proverbs or sayings) that encourage good behavior and offer good advice, and many are found on plates and mugs made for children. I thought I'd show some that have morphed into my New Year's resolutions. "Experience keeps a dear school, but fools will learn in no other," is one of my favorite maxims. I have often wanted to say it to friends and family, but knew it would offend. So, I use it to remind myself that I am never too old to be foolish. Or, "Dost Thou Love Life Then Do Not Squander Time. There Will Be Sleeping Enough In The Grave." I shall remember not to waste the time I have left. 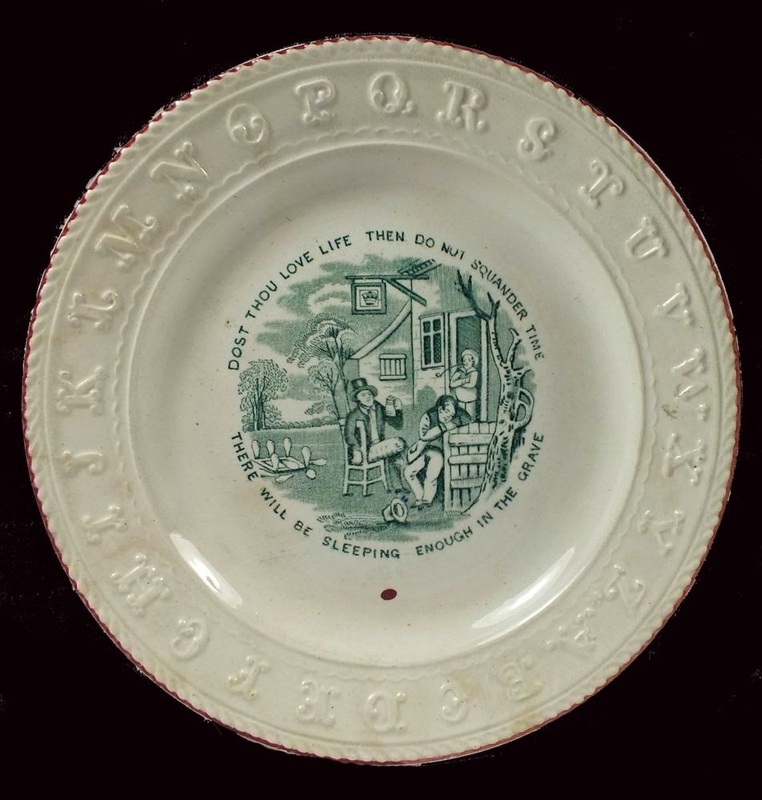 Child's Plate, "Dost Thou Love Life Then Do Not Squander Time/There Will Be Sleeping Enough In The Grave"
Franklin's maxims about work are priceless (I have used this word on purpose): "Keep thy shop and thy shop will keep thee" is something I remind myself often. This maxim is supported by another: "If you would have your business done go if not send." 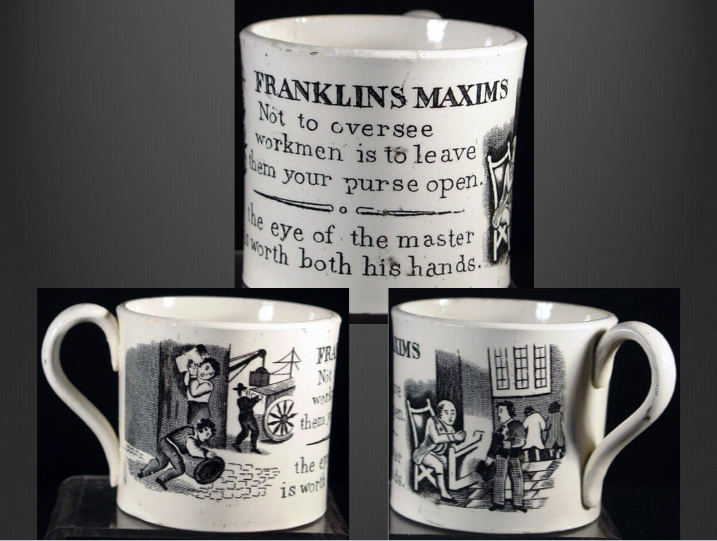 Three views of a child's "Franklin's Maxims" mug "Not to oversee workmen is to leave them your purse open./The eye of the master is worth both his hands." 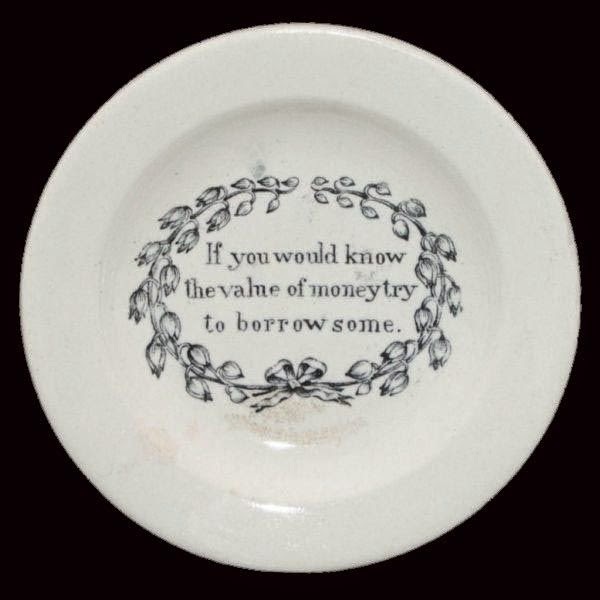 The tiny plates below offer big advice! 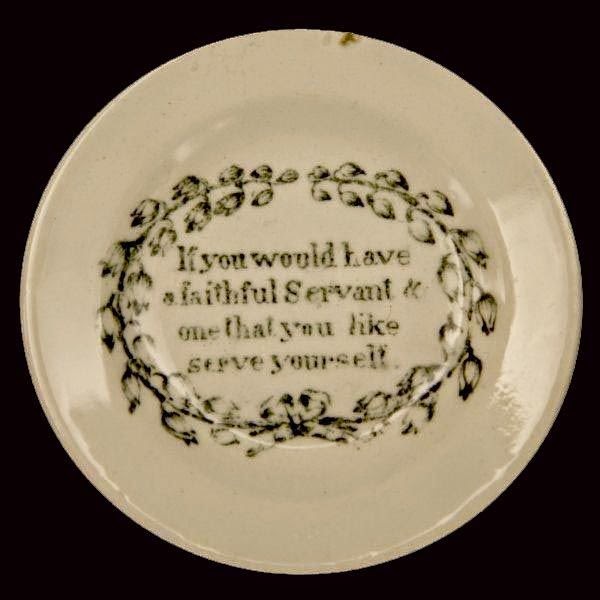 Child's 3 inch plate "If you would have a faithful Servant & one that you like serve yourself"
Child's small plate "If you would know the value of money try to borrow some"
The maxims are from Benjamin Franklin's Poor Richard's Almanack, which he first published under the name Richard Saunders in 1732, and continued to publish for about 25 years. The sayings were and remain immensely popular. 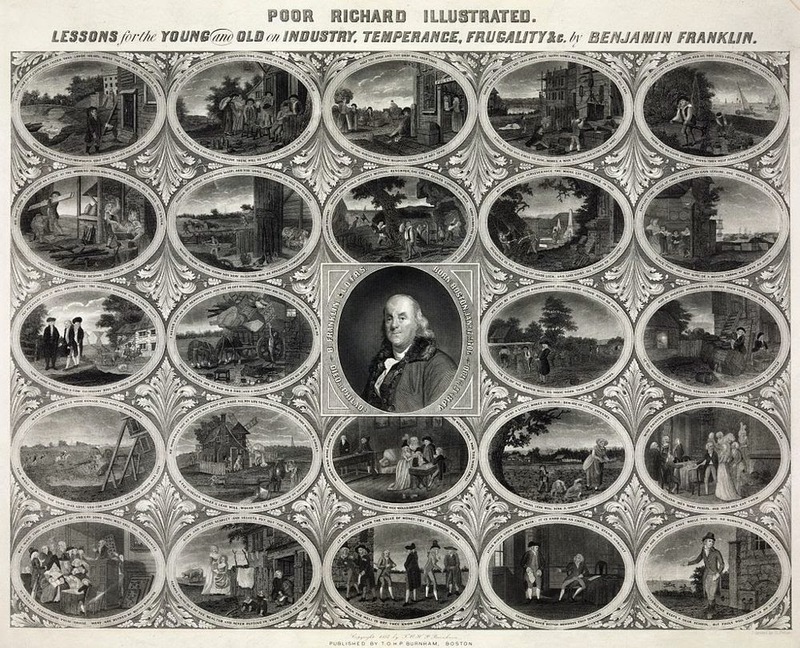 Some of the sayings were illustrated as early as 1795 by Bowles and Carver with the title Bowles's Moral Pictures, or Poor Richard Illustrated. 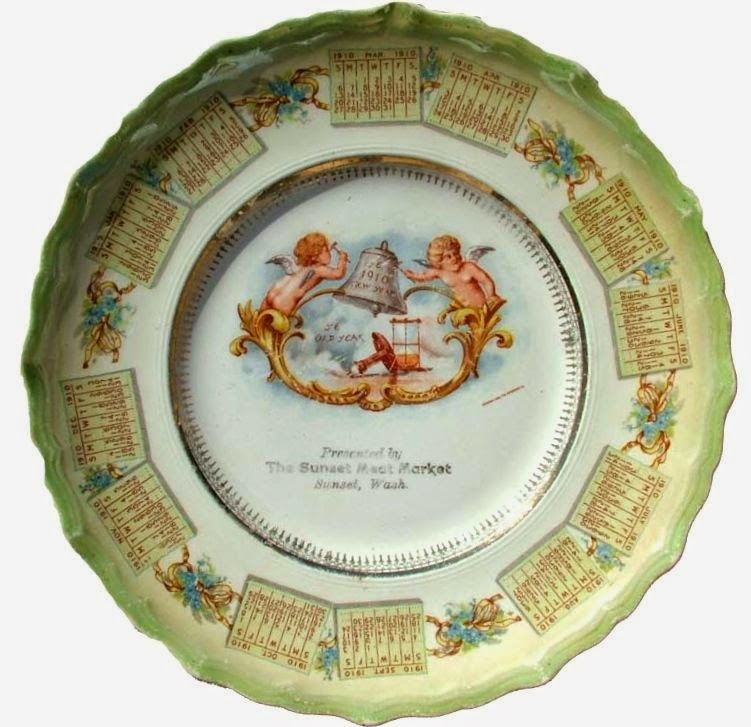 Another version was made soon after by the artist Robert Dighton and engraved by Oliver Pelton. These illustrations were called Poor Richard Illustrated. Lessons for the Young and Old on Industry, Temperance, Frugality &c. by Benjamin Franklin. (I love the over-long title). I am showing the poster or broadsheet below so that I can underscore the fact that Franklin intended his maxims for the old as well as the young. They have guided me all of my life, although I haven't always heeded the advice! 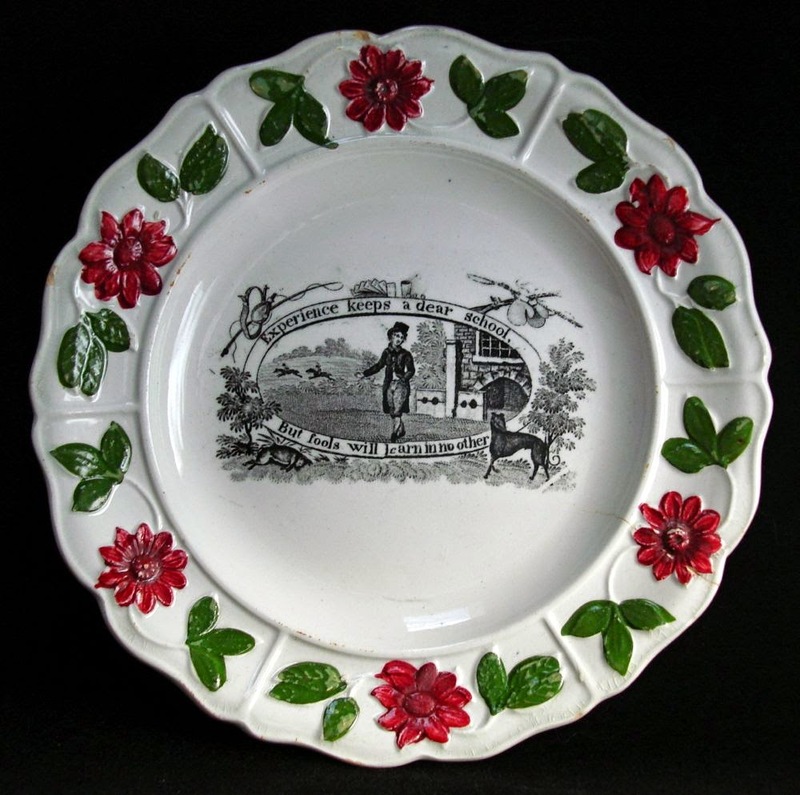 Although not all of the illustrations for the maxims on the plates and mugs are copied from the poster above, many are. 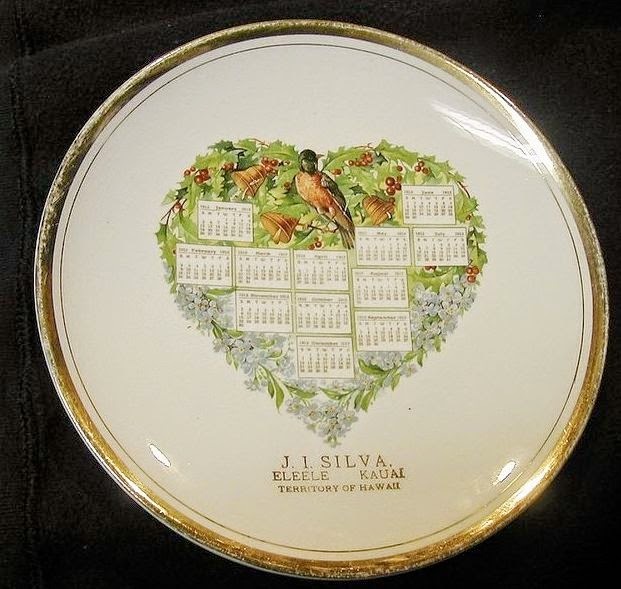 The pattern on the plate below is the second from the left on the third row down. The illustration for the maxim on the first plate shown above, "Experience keeps a dear school/But fools will learn in no other," is on the bottom right. 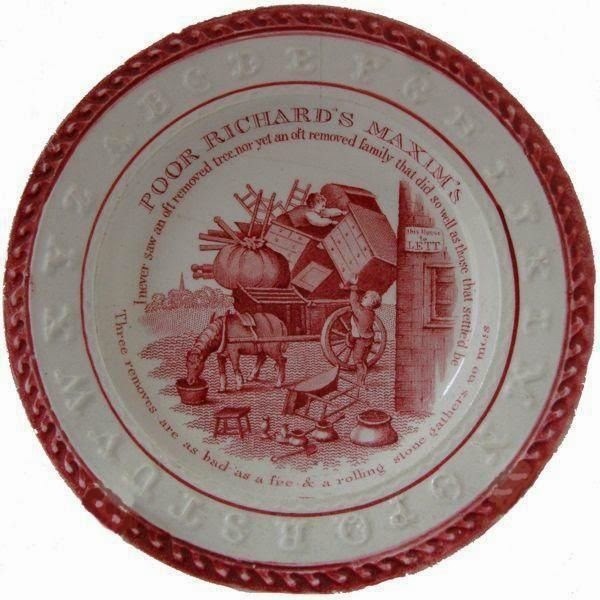 Child's five inch plate "Poor Richard's Maxim's (sic) I never saw an oft remove tree nor yet an oft removed family that did so well as those that settled be. Three removes are as bad as a fire & a rolling stone gathers no moss." "A rolling stone gathers no moss," found on the plate above, is one of my favorite sayings. I'll end with two more of my favorites. What I think of as "words to live by." They are: "Make Hay While The Sun Shines" and "For Want Of A Nail The Shoe Was Lost." 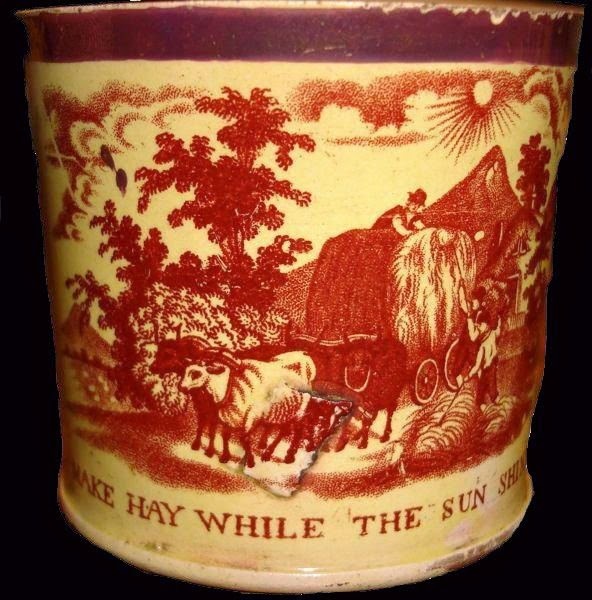 Child's 2.5 inch yellow glazed mug "Make Hay While The Sun Shines"
Child's plate "Franklin's Maxims/Want of care does more damage than want of knowledge. For want of a nail the shoe was lost & for want of a shoe the Horse was lost." My New Year's resolutions are connected to the maxims above. 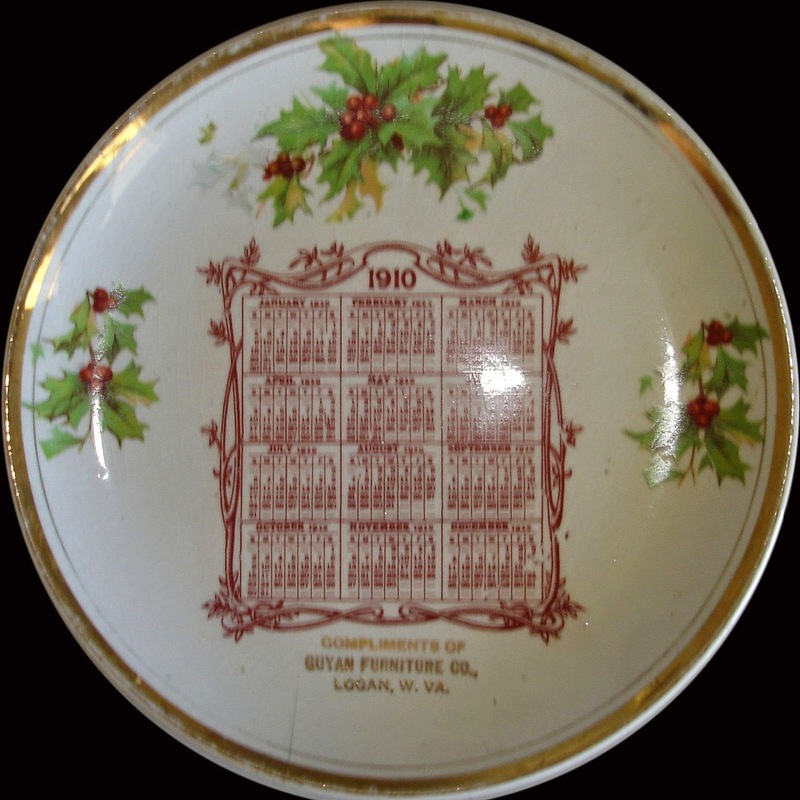 I tend to forget my New Year's resolutions, so hopefully the maxims and the transferware will remind me. HAPPY NEW YEAR TO YOU ALL! The wolf also shall dwell with the lamb, and the leopard shall lie down with the kid; and the calf and the young lion and the fatling together; and a little child shall lead them. These Bibical words inspired a few transferware patterns. The most famous is Millenium, which I wrote about in June 2013. 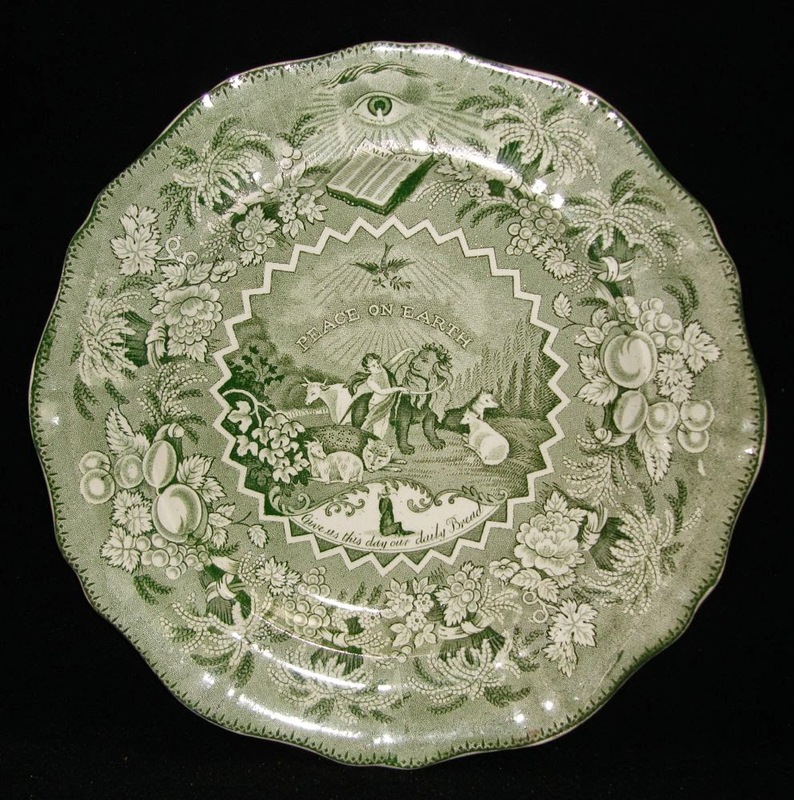 If you are interested in the symbolism on this plate, click on the link above. 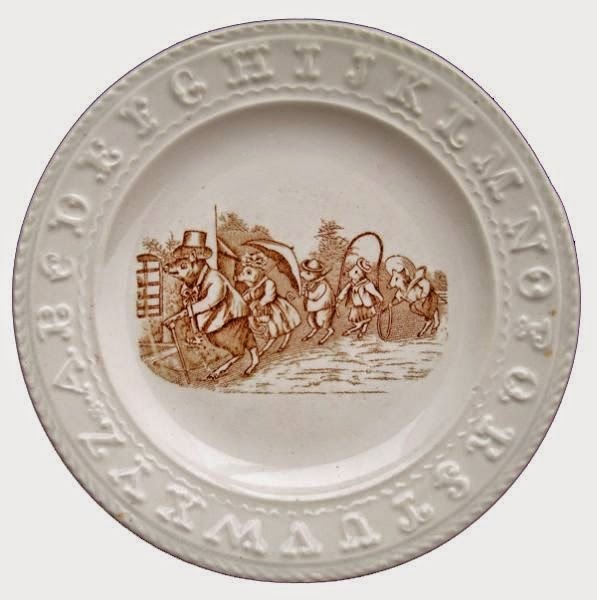 The small plate only shows the word Peace as well as the lion, the fatling (yearling), and the child. 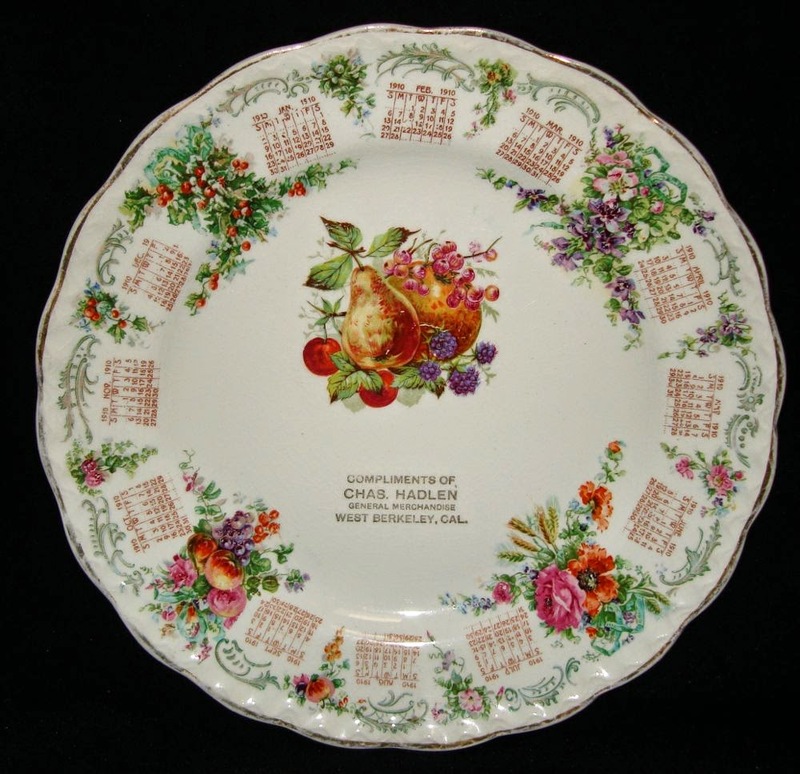 The 10 inch plate below shows the whole pattern. Now the plate is large enough to show the words Peace On Earth. The wolf, the lamb, the leopard and the kid join the lion, the fatling and the child. The calf appears to be missing. 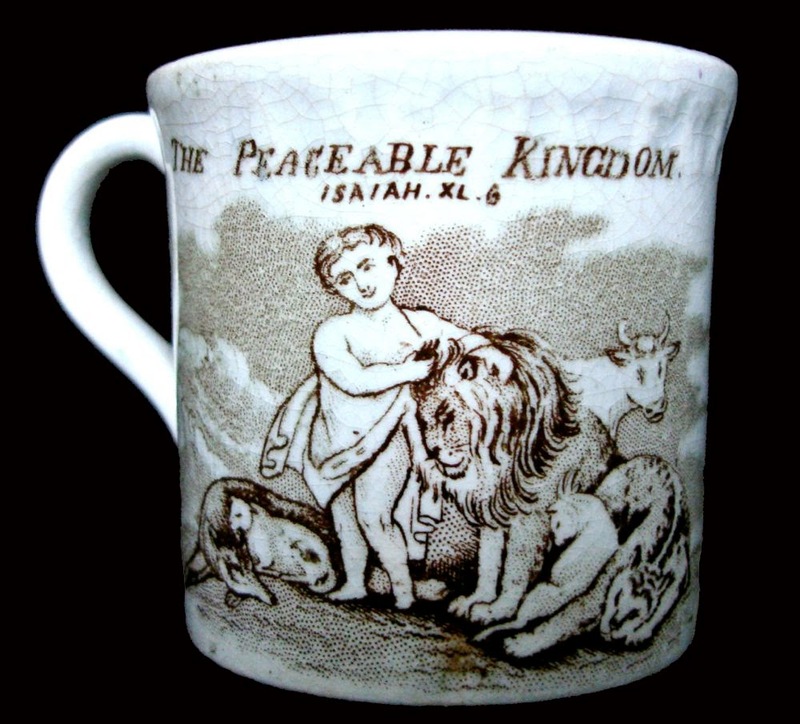 Titled The Peaceable Kingdom Isaiah XL.6, this 2.5 inch child's mug illustrates the same passage from the Bible as the Millenium pattern. Here, the child holds the lion's mane in his hands. The wolf and the lamb are to his left and the leopard and the goat are to the right of the lion. The fatling stands behind the lion. Although difficult to see, the border is a molded alphabet. 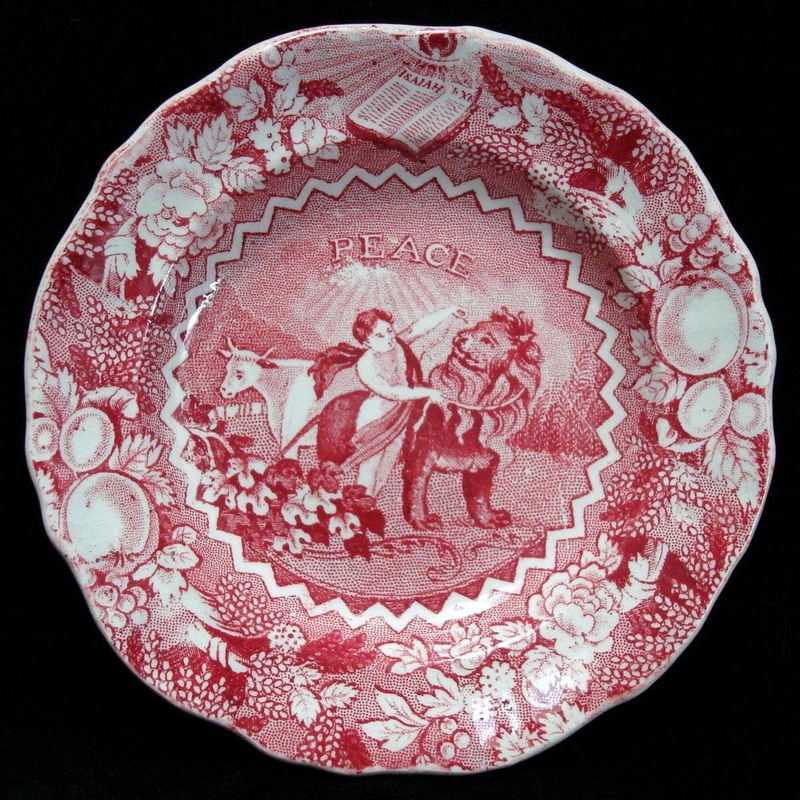 Peace is the title of the pattern on the saucer below. It also illustrates Isaiah 11:6. Only the child, the lion and the lamb are shown. The child appears to be sitting astride the lion. The mark features a dove with an olive branch in its mouth. 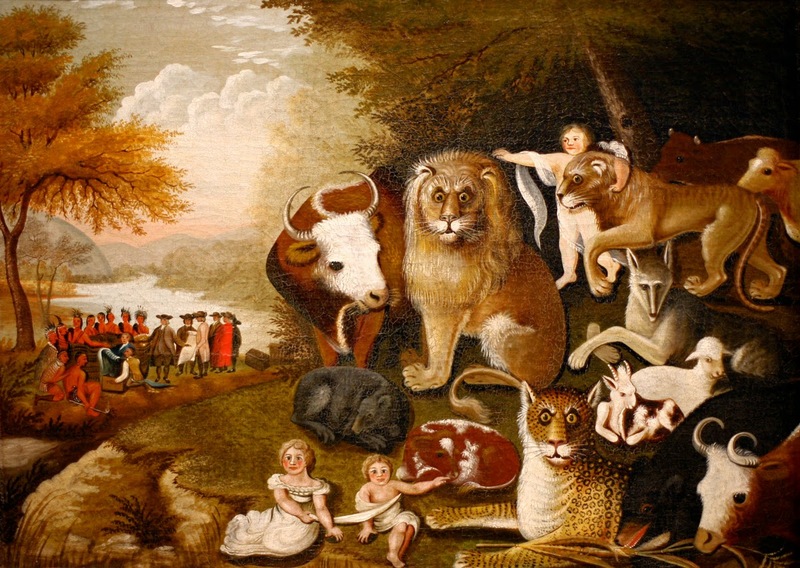 One of my favorite paintings is William Hick's Peaceable Kingdom. It also illustrates Isaiah 11:6. I wish you all Peace and Joy! Happy Holidays! I wrote an article for the Transferware Collectors Club Bulletin in 2012 titled Inappropriate Patterns For Children. 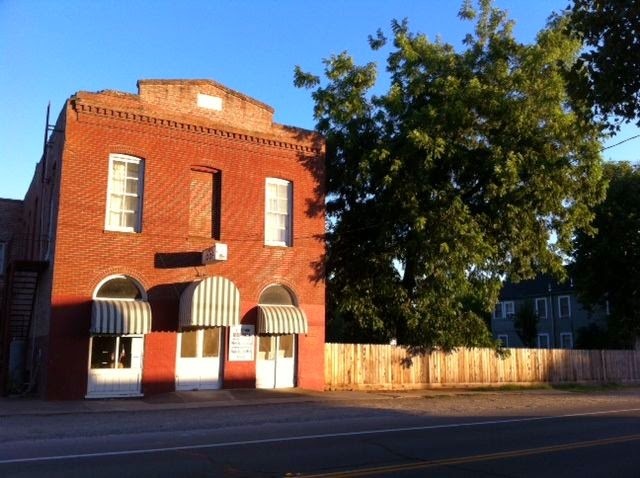 I decided to redo the article for my blog as the topic is such a favorite of mine. I am the editor of Children's Subjects for the TCC Pattern and Source Print Database, so I see a lot of 19th century children's patterns. Many are sweet and instructive, but some are horrific! Children haven’t changed in the past two hundred years, but the concept of childhood and what is appropriate for children has changed. 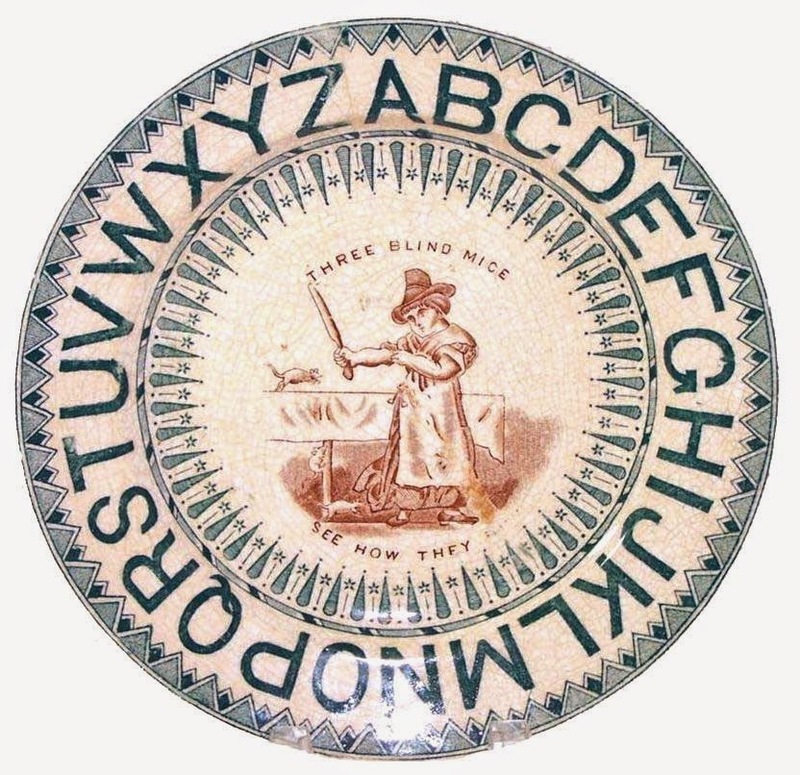 Nineteenth century British children’s mugs and plates were created as inexpensive gifts or rewards to teach religion and the alphabet as well as to delight with pictures of animals and children’s activities. However, some of the patterns found on this pottery are frightening! 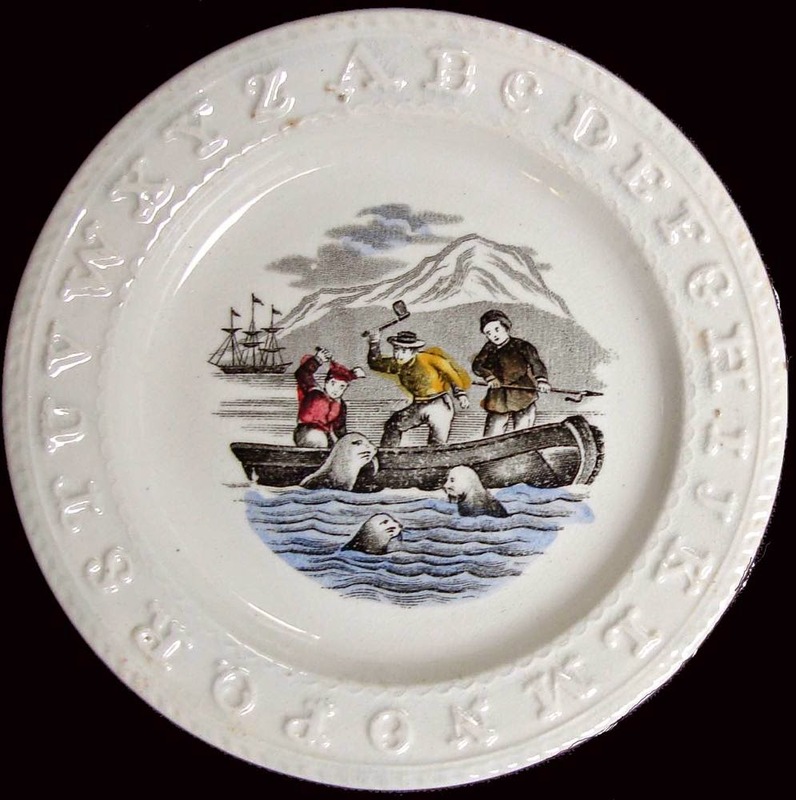 Seal Hunt, which was made by Thomas Elsmore & Son (1872-1887), illustrates a method of seal hunting. 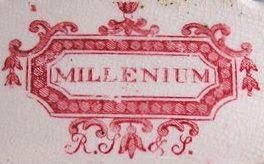 The molded alphabet border does aid in learning the alphabet, but the clubbing of seals would be deemed an inappropriate gift for today's child. The next pattern, The Romish Bishop Bonner, which was made by Powell & Bishop (1876-1878), is an odd choice for a child even though it was intended to teach a religious history lesson. Perhaps this pattern was a reward for doing well in Sunday School. Substitute the word Catholic for Romish, as the history lesson is about Bishop Edmund Bonner (c.1500 to 1569) who served during the reigns of Henry VIII, Edward VI and Mary I (aka Bloody Mary). Actually, Bonner was known as Bloody Bonner. He was able to survive quite awhile during the enormous upheaval of the English Reformation, as he changed his ideas about religion (Catholic, Protestant, Catholic) to that of the reigning monarch. During the time of Queen Mary, who reinstated Roman Catholicism, he burned many Protestants, including Thomas Tomkins. 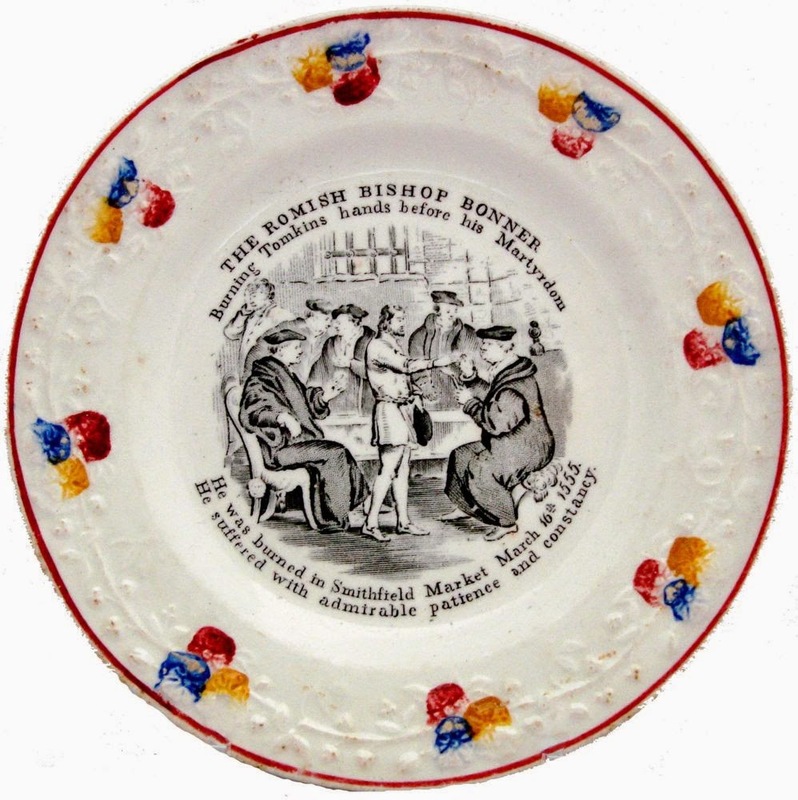 The description of Tomkins martyrdom is quite gruesome, but, as stated on the plate, he withstood it well. 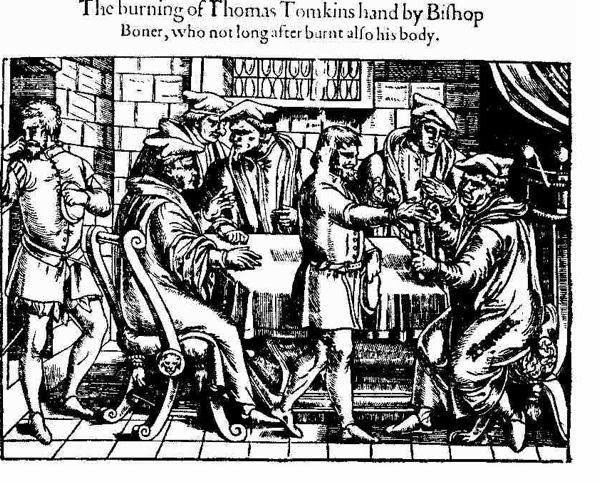 The entire text reads: "The Romish Bishop Bonner Burning Tomkins hands before his Martyrdom. He was burned in Smithfield Market March 16th 1555. He suffered with admirable patience and constancy." Bonner was imprisoned for refusing to take the Oath of Supremacy at the beginning of the reign of Elizabeth I (another Protestant). He died in prison in 1569. This is an excellent history lesson but a rather morbid topic for children. Note the source print for the pattern, which is a woodcut from John Foxe’s Book of Martyrs, ca. 1570. Although not frightening, the pattern is inappropriate humor (not even vaguely humorous today). The title, Flow Thou Regal Purple Stream, refers to the bloody nose of the boy who is second on the left. 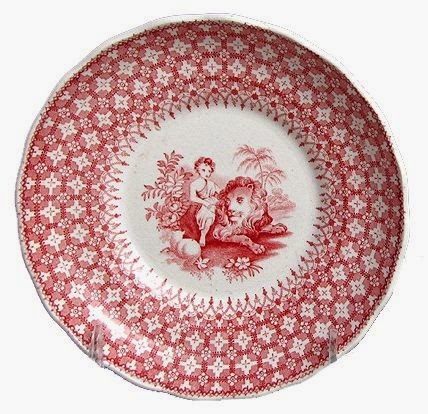 One wonders why this particular scene was considered an interesting pattern for a child’s plate. Were the boys heroes for fighting? Was a bloody nose a badge of honor? Fighting and bloody noses (from fighting) are certainly frowned upon in the 21st century! 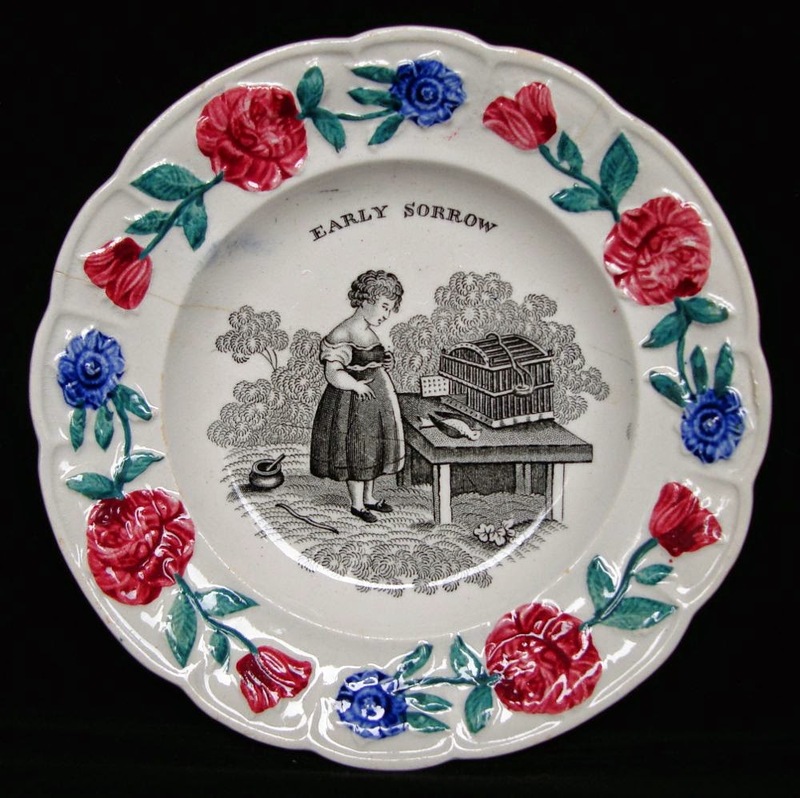 Early Sorrow is a sad reminder of the familiarity that the 19th century child had with death. When mothers died regularly in childbirth and siblings succumbed often to disease, one does wonder why a child needed to be reminded of the prevalence of death. However, the death of a pet, in this case a pet bird, is the same today as it was in the 19th century; an inoculation against a greater loss. Still, this pattern would not be eagerly sought as a gift for today's child. This gift for a good and well-loved child is a mug with the inscription, Present For My Dear Boy. I doubt, however, the choice of a fox running off with a goose clamped in its mouth is something conducive to milk drinking. Although the poem titled My Grandmother has good intentions, it has the unfortunate mention and illustration of a dead dog! The poem, which was written by William Upton, was copied from a picture sheet for children published by William Darton, Jr. in London in 1813. The poem reads: “Who took me in a coach to ride/Because I griev’d when Puggy died/And bought me Sugarplums beside/My Grandmother.” The grandmother is doing her best to cheer up her granddaughter, but I doubt the pattern would be given to a granddaughter today. As mentioned, children’s patterns were often meant to teach the alphabet. 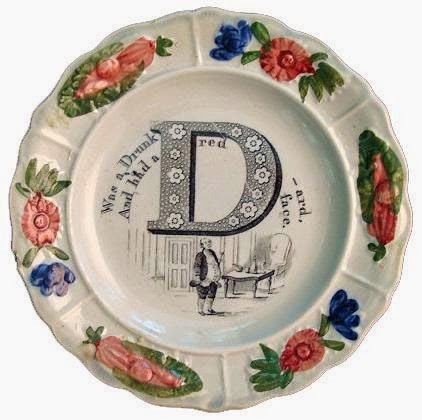 This plate shows a large and attractive letter “D”. 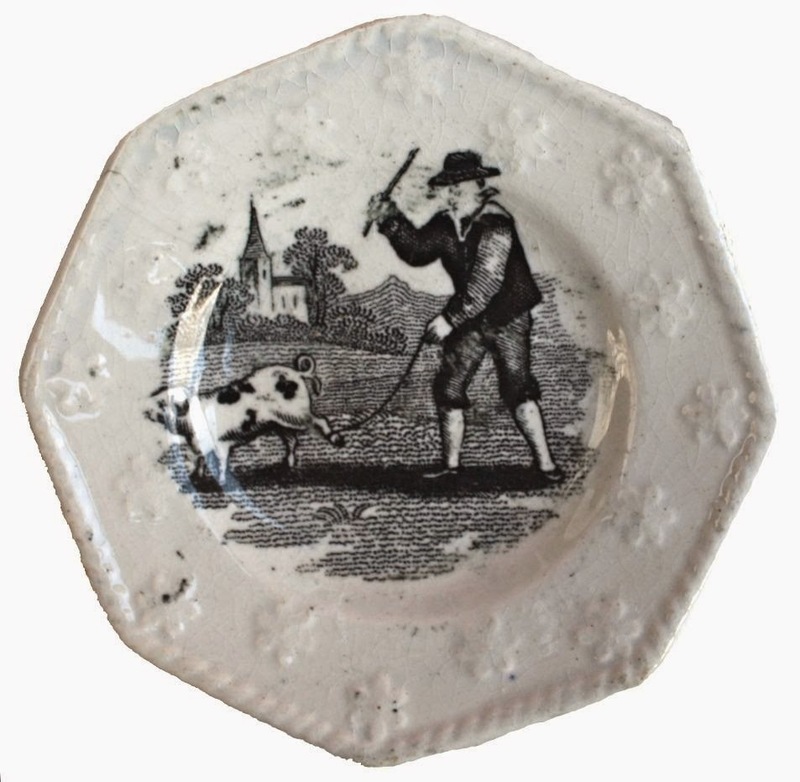 However, instead of illustrating the letter with a cute dog or dear dolly, it is matched with a drunkard and the rhyme “D Was a Drunk-ard (notice how even the word is falling down)/And had a red face." 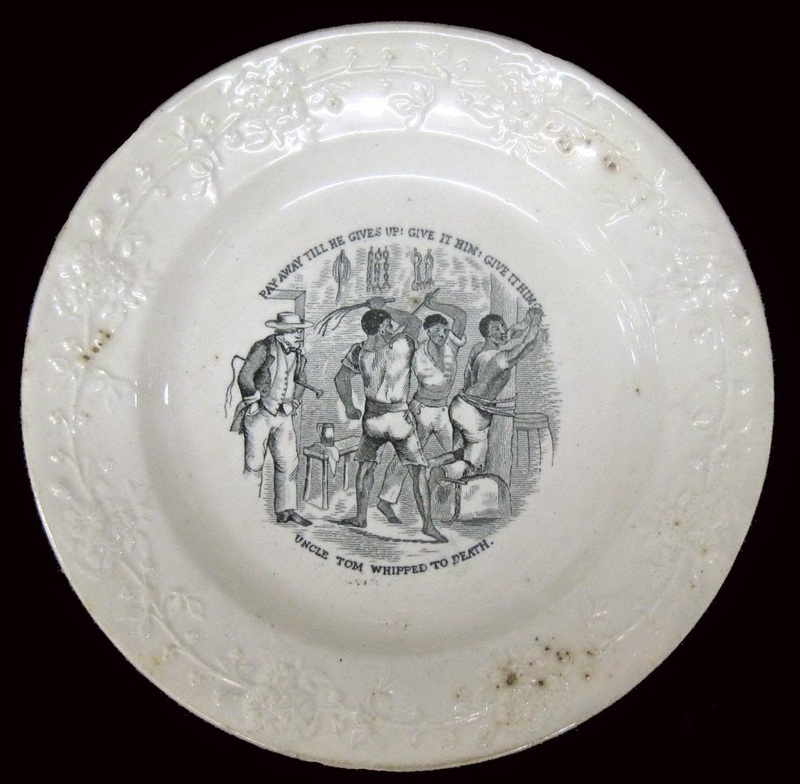 The plate below illustrates a scene from the very popular anti-slavery book Uncle Tom’s Cabin by Harriet Beecher Stowe, which was published in 1852. 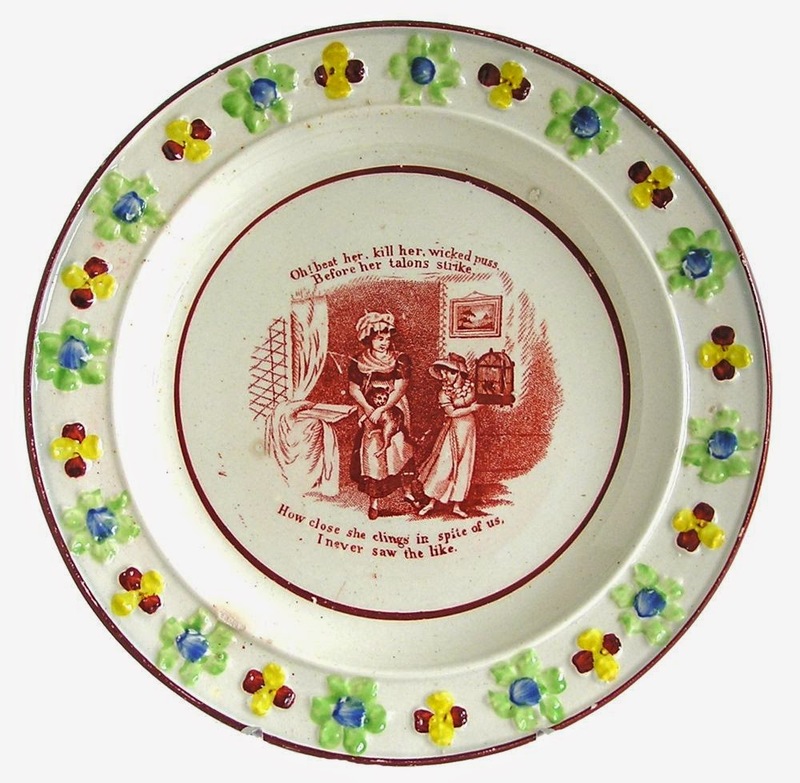 Many scenes from the book were used on children’s plates, but none are as violent as the pattern seen here: “Pay Away Till He Gives Up: Give It Him: Give it Him! Uncle Tom Whipped To Death.” The pattern is frightening and a bit sordid. 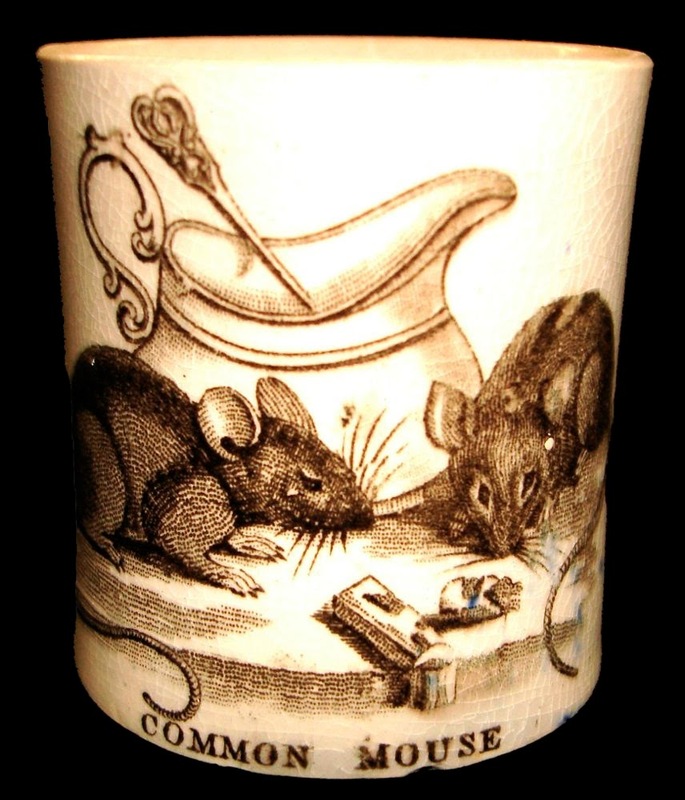 I never thought of the violence inherent in the nursery rhyme Three Blind Mice. I sing it to my grandchildren. Visually, the plate below reminds me of the shower scene from Hitchcock's Psycho. I would never give it to them as a gift. Now I'll think about the words too! As a cat lover, perhaps I am being too sensitive to the use of the words wicked and kill in the plate below. My granddaughter didn't like these words either. I hope you will send along a few of your inappropriate patterns for children. 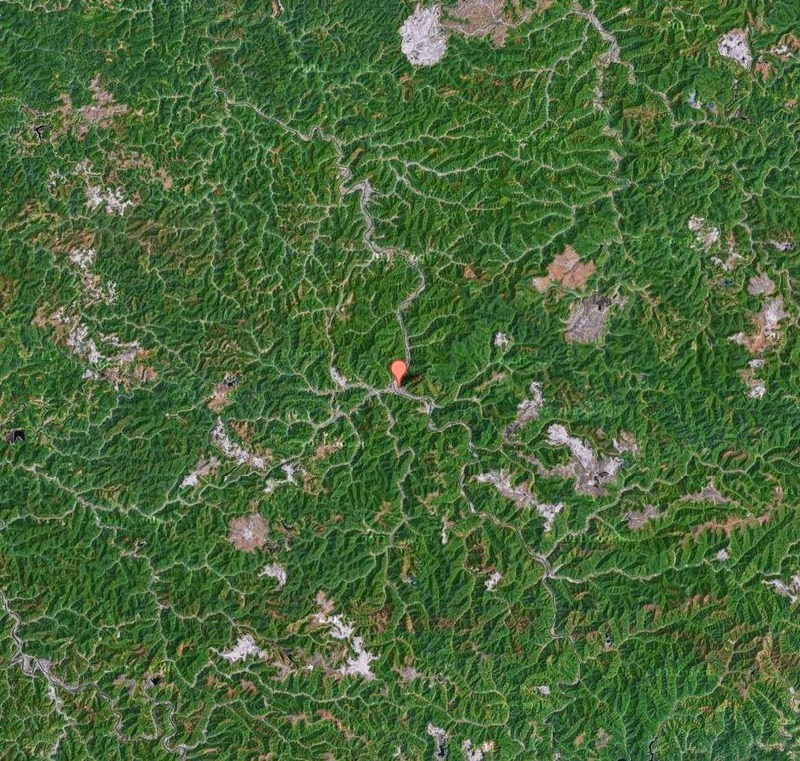 My blog is a fine repository for these patterns, but perhaps not the hands of our little ones. 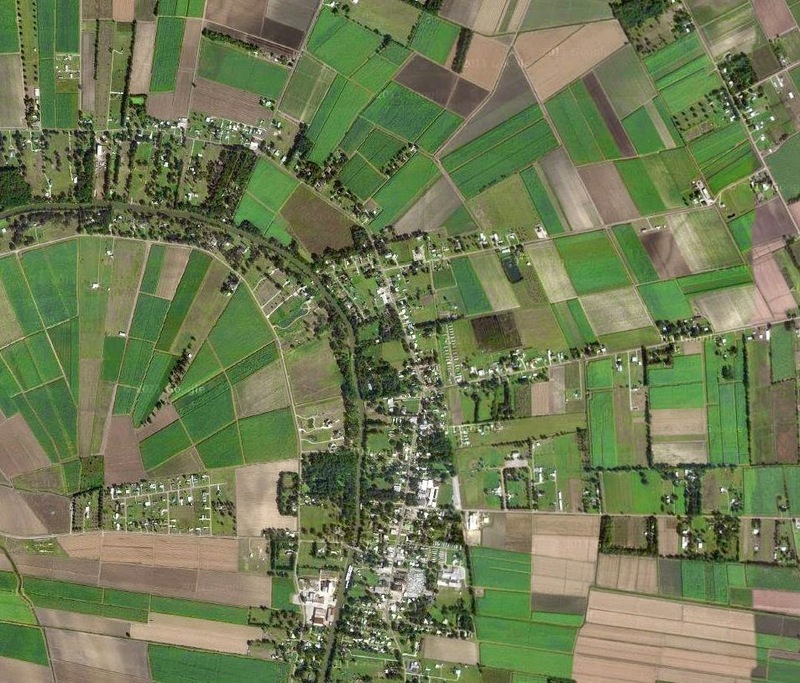 Burns was a ploughman, not a farmer (he didn't own the land). He was similar to the itinerant workers that people the California farm in Steinbeck's book. Below, see Burns apology to the mouse for accidentally destroying her nest while he was ploughing. 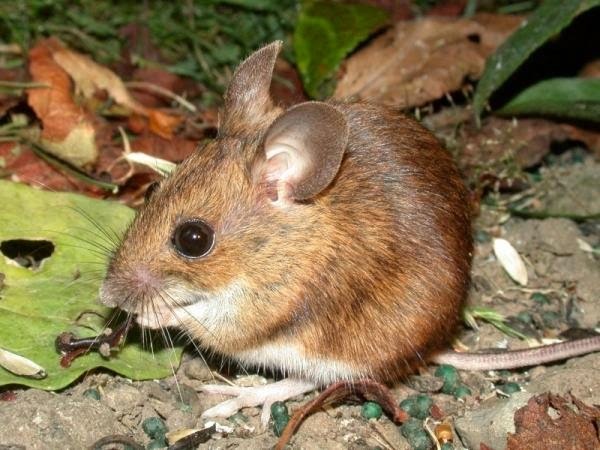 Burns notes the bond between himself and the mouse who are both in thrall to chance and nature. Steinbeck sees the same bond between George and Lennie. However, both Burns and George suffer from the knowledge of the past and the fear of the future while Lennie and the mouse are blessed with a constant present. I read Of Mice And Men for my December book club. The last time I read it I was fourteen. I liked it then. I read it for a class, and it was short. Now, I felt nearly overwhelmed by the loneliness, longing and pathos of the men and the deaths of the animals and Lennie. Now I cried for the wife who was only a girl. Old age has changed me. 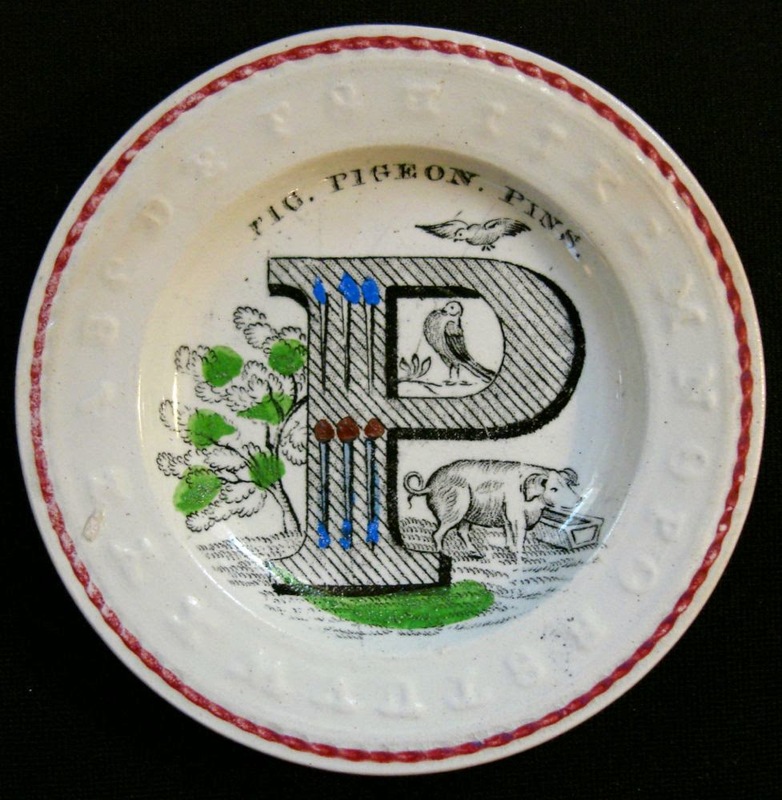 Child's 7 inch alphabet plate; "P/ Pig, Pigeon, Pins"
I was told a long time ago that pigs aren't common on transferware patterns. That said, they certainly appear often on patterns intended for children. 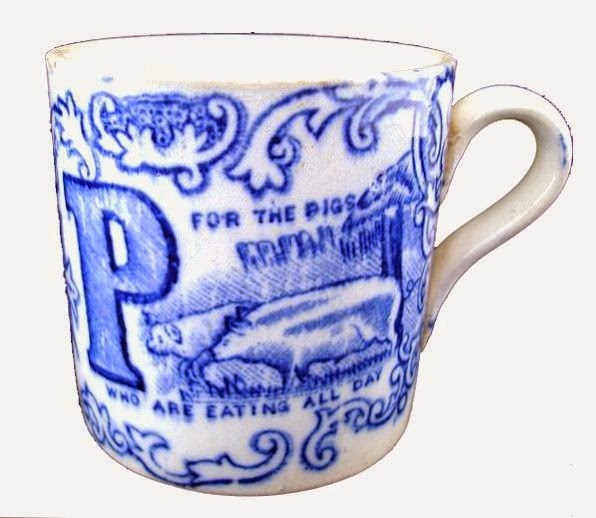 For example, the pig is often used to illustrate the letter "P."
On its own, the pig is a recognizable and loved farm animal or as a character in a story. 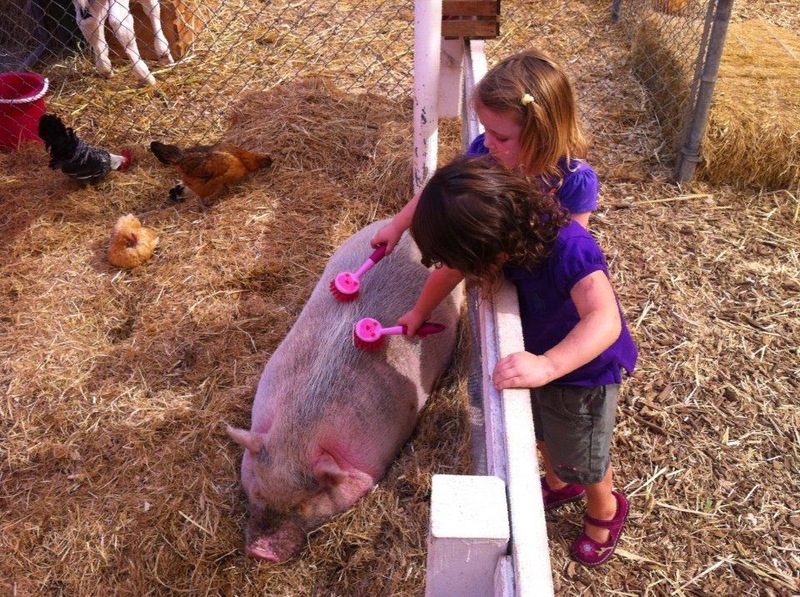 I just watched "Charlotte's Web" (2006 movie version) with my four year old granddaughter, and I can attest to the fact that she loves Wilbur (the humble pig). Of course, 19th century children wouldn't have been familiar with E.B. White's masterpiece, but they would have known "The Three Little Pigs." 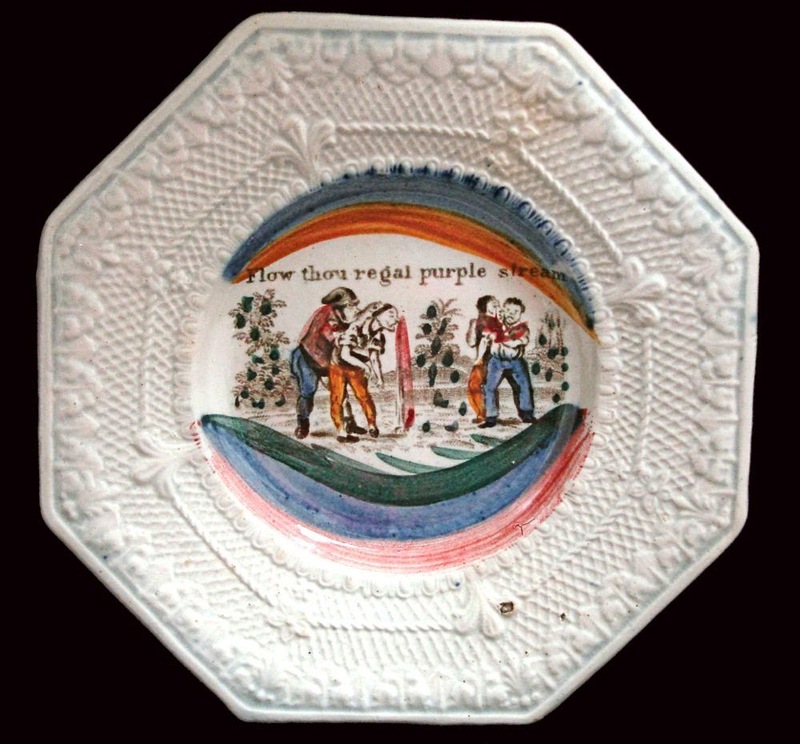 Toy plate, 3 inches. Here, a man walks a pig (perhaps to market). There is a rope around the hind foot of the pig, and the man carries a stick. I imagine he is afraid of getting bitten. The rope probably hobbles the pig. Pigs also star in humorous patterns. 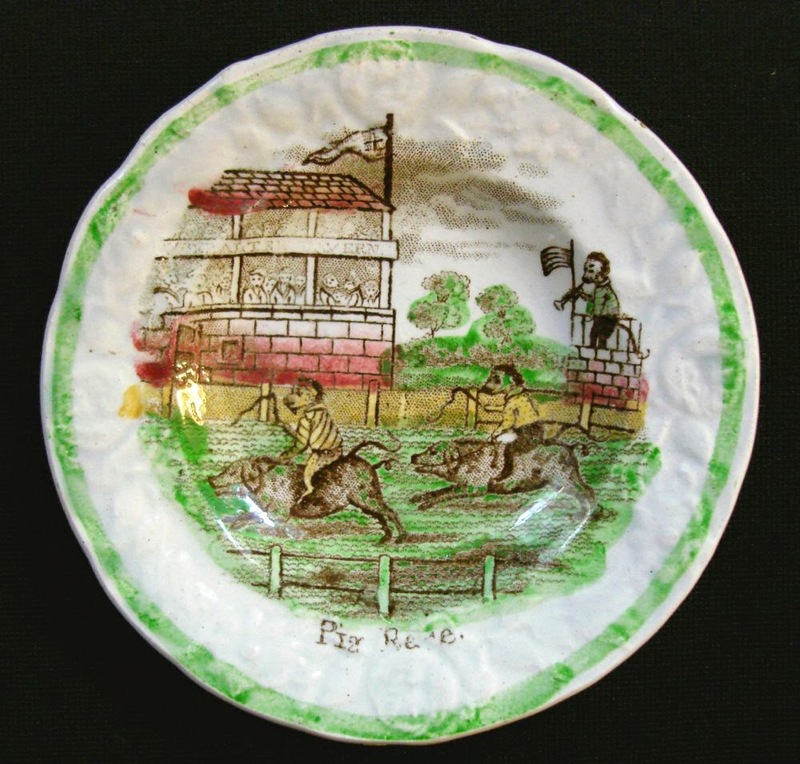 "Pig Race" child's plate. This is a humorous scene with pigs instead of horses and monkeys instead of jockeys. The grandstand is full of animal spectators. 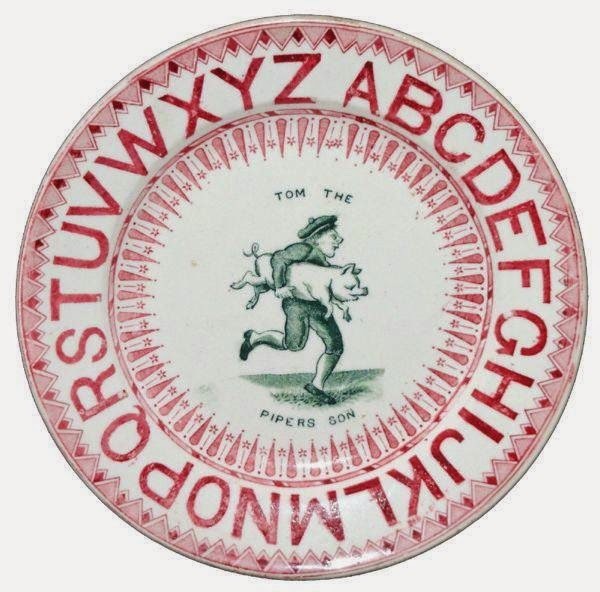 Child's 7.25 inch alphabet plate with five pigs wearing clothes. They look like a family going on their Sunday walk. 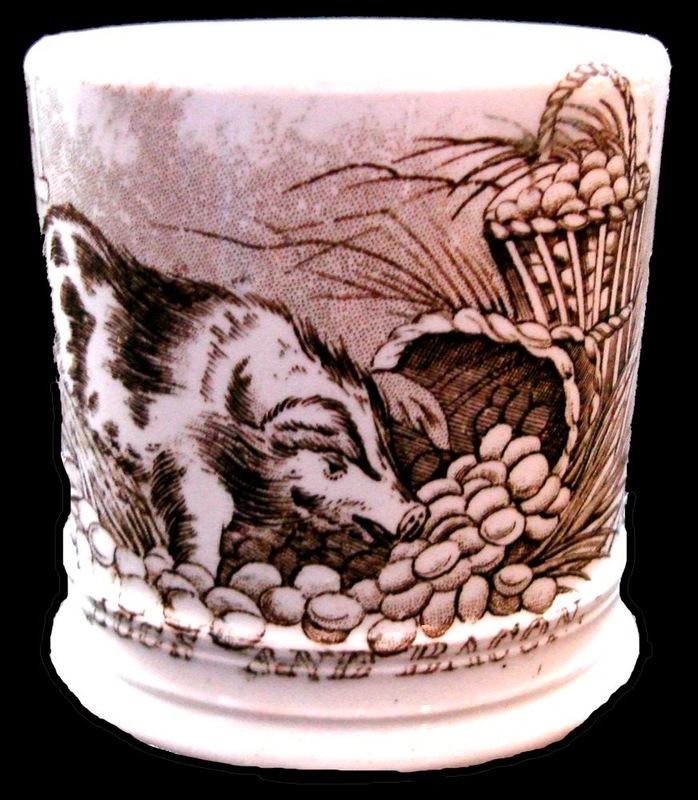 "Eggs and Bacon" mug. It looks as if the pig will eat the eggs before he is made into bacon! 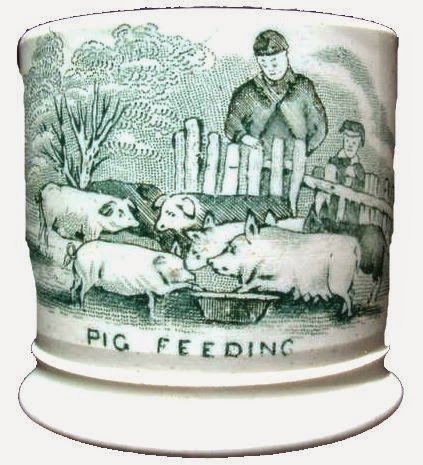 Pigs are a popular staple of children's pottery and stories. 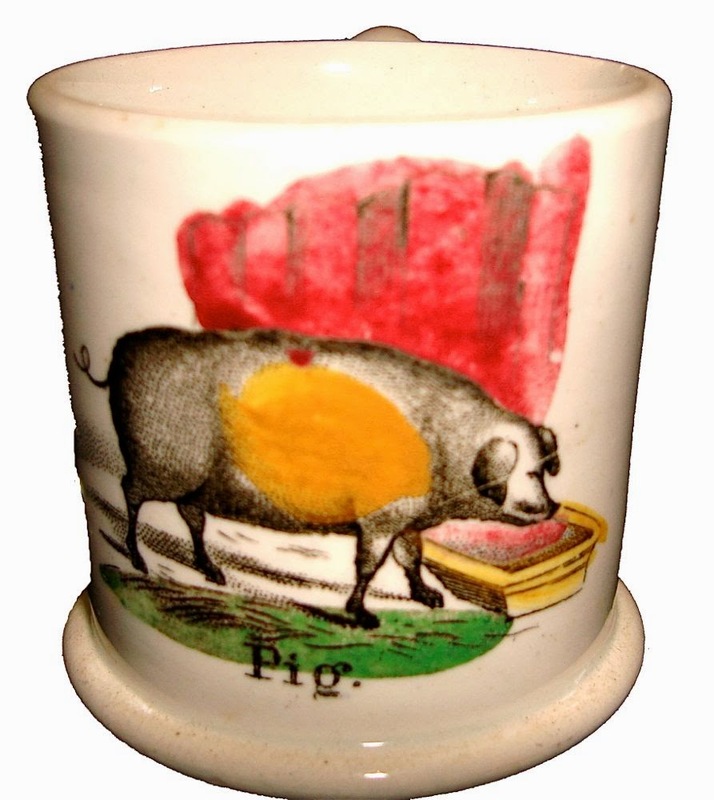 I know the little 21st century girls grooming the pig below would love one of the plates or mugs seen here (I have asked). Nineteenth century children definitely did! 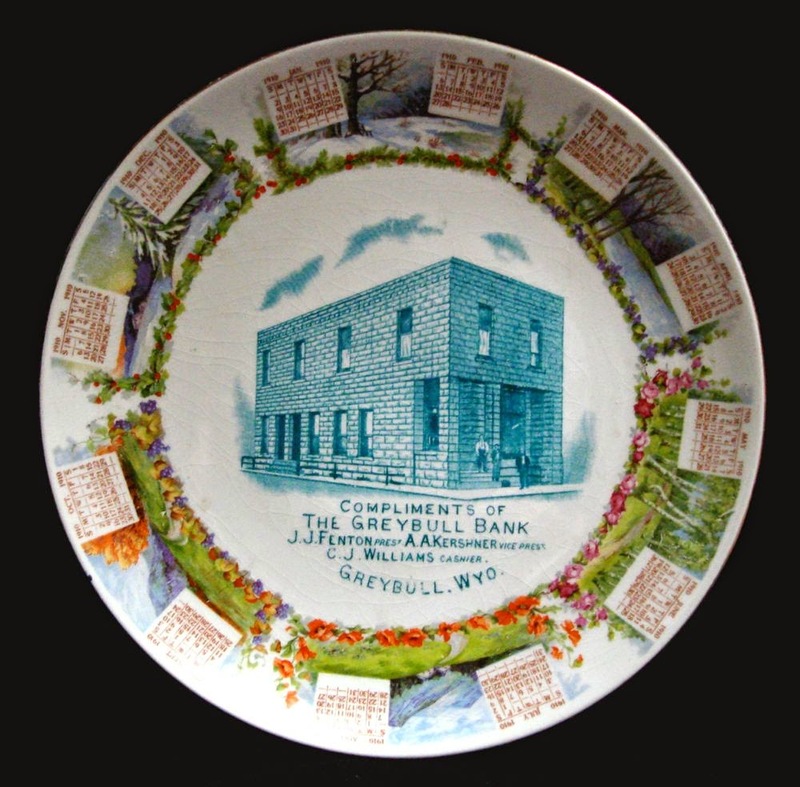 Here is a history of the expansion of America as seen through the giveaway plates of the early 20th century. 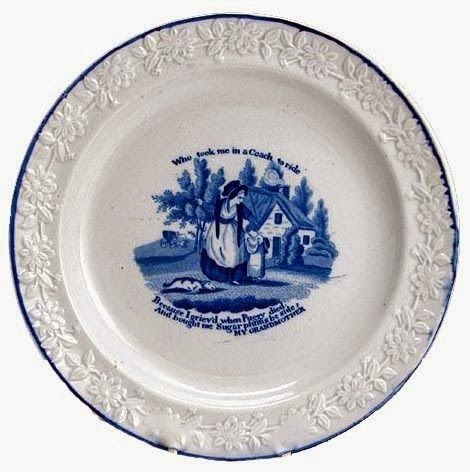 Although they are not transferware, they are dishes! Those of you who know me are aware of my passion for advertising ceramics. 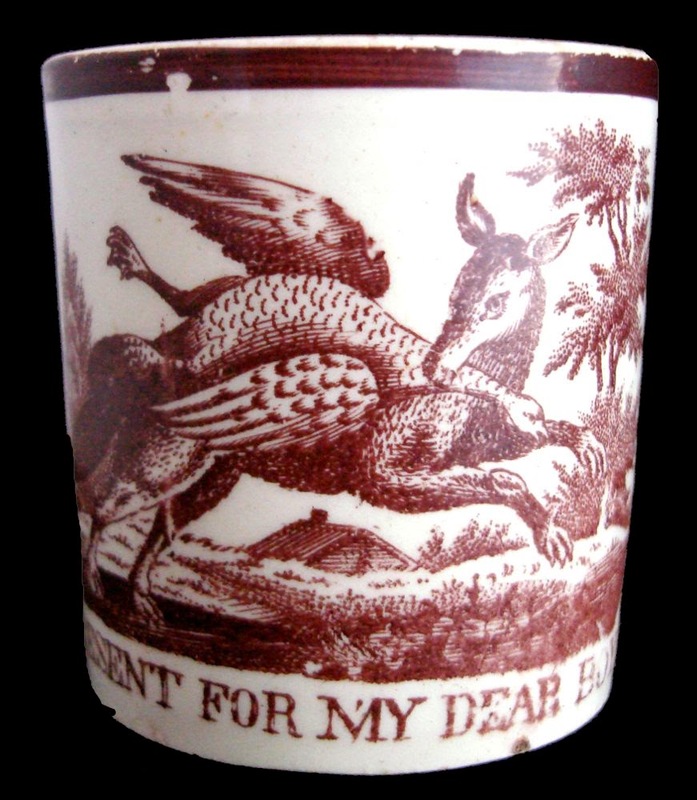 Up to three or so years ago, this passion had been limited to 19th Century English transfer-printed containers. 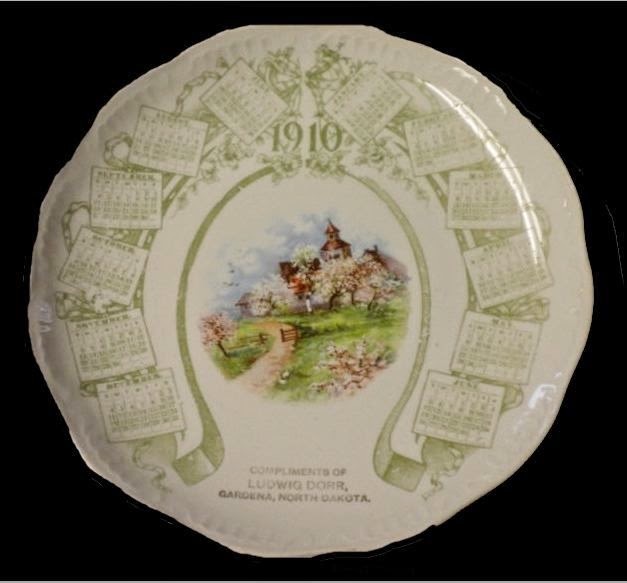 Then one day I discovered a plate featuring a 1910 calendar and nice center pattern, offered as a complimentary gift to customers by a merchant in Berkeley, California. Berkeley is my home town; a new passion was created! 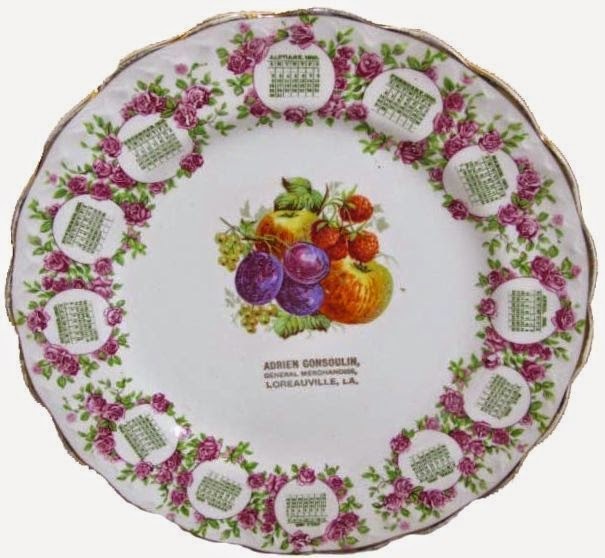 These plates are American, produced primarily in East Liverpool Ohio and nearby towns, were all complimentary from local merchants, and were primarily distributed between 1906 and 1921, peaking in 1910. 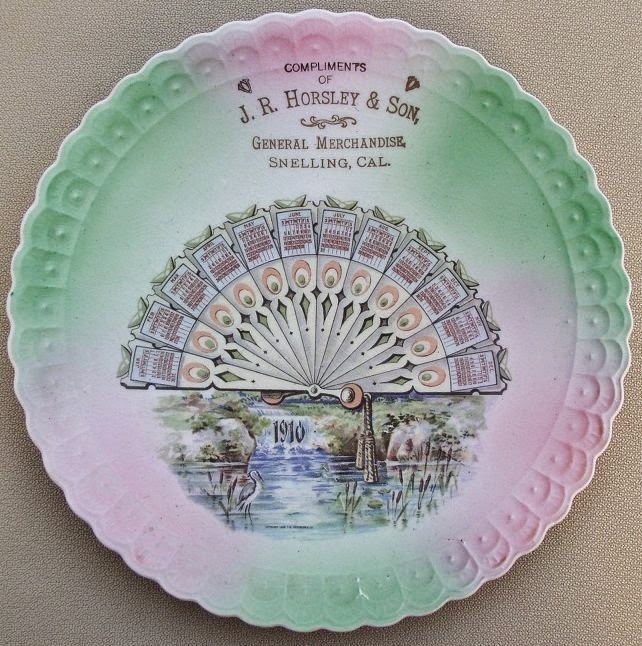 I have documented approximately 1,300 plates from 1910 to date, mainly from eBay. The patterns are printed from decals; I have identified 191 patterns thus far. 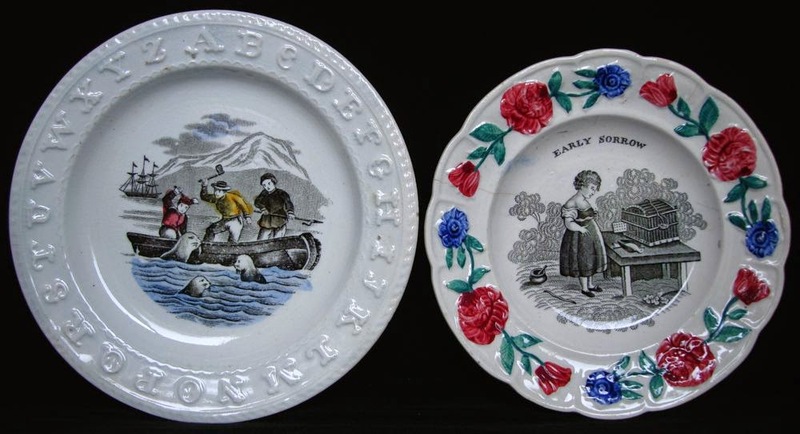 However, to me the fascinating aspect of these plates is not their patterns or method of manufacture, but the stories one can elicit by researching the merchants and the towns where they sold their wares. 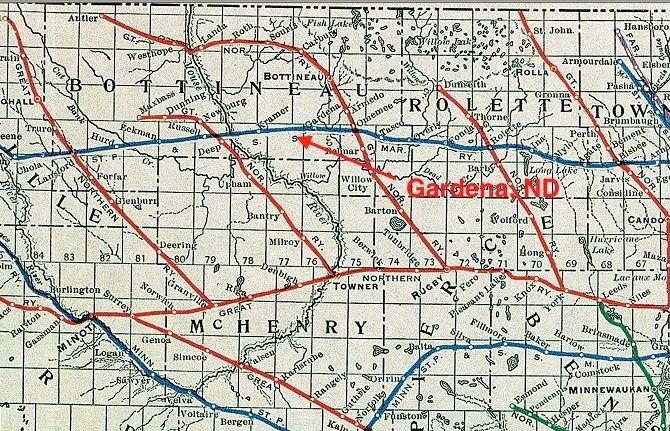 I have learned about the settlement of North Dakota by the railroads, who laid thousands of miles of track across the state in just a few decades, and then provided free passage and often free land in exchange for the expectation that the farmers would ship their goods to market by rail (there was no alternative!). 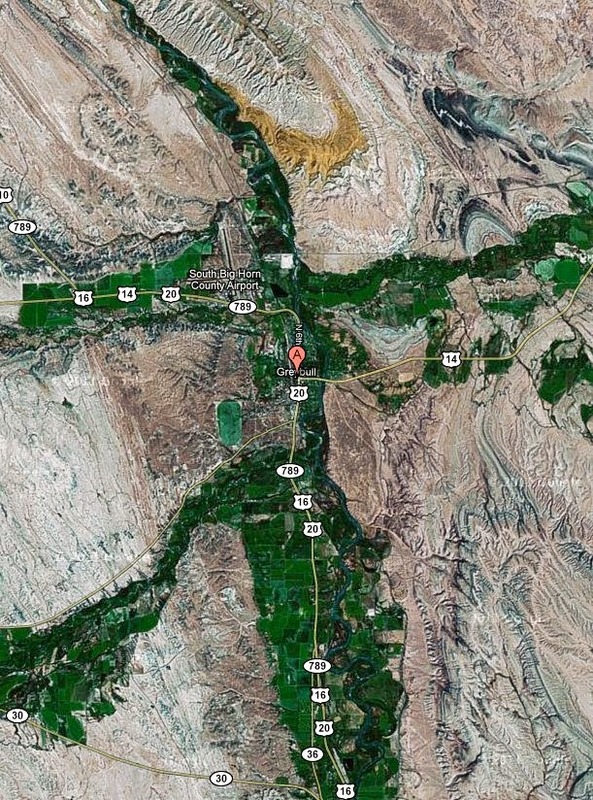 Hundreds of towns were established along the rail lines, and not a few no longer exist or at best have managed to maintain the same minimal population as existed soon after they were founded. 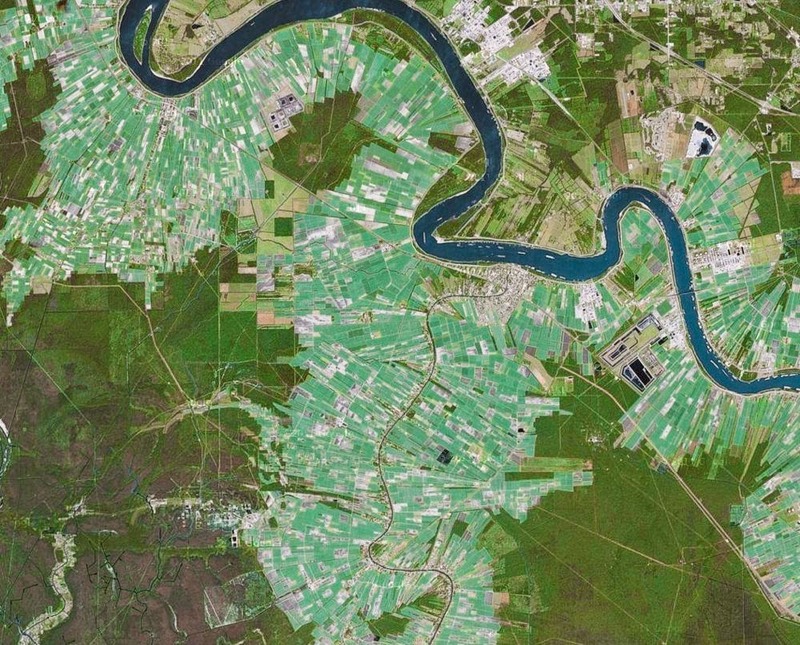 I learned about the French Arpent system of land surveying, employed in Louisiana to provide maximum river access to growers so they could ship their crops by barge. 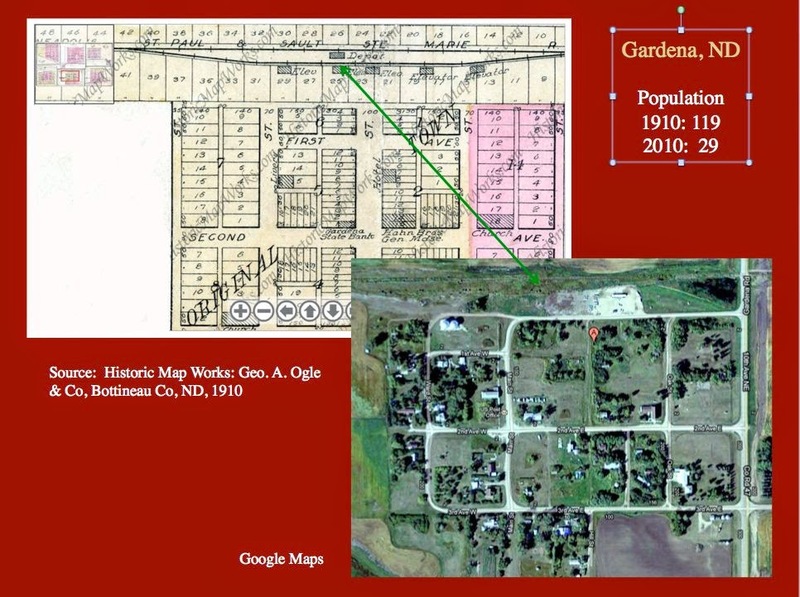 All of the rest of the US is surveyed under the Public Land Survey System, based on square sections and townships. 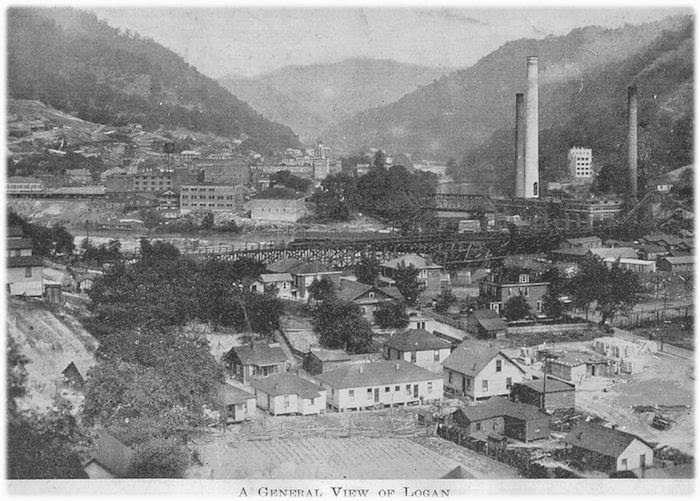 I’ve observed the devastation of coal strip mining in West Virginia, and the huge influence of petroleum in 1910 Wyoming. 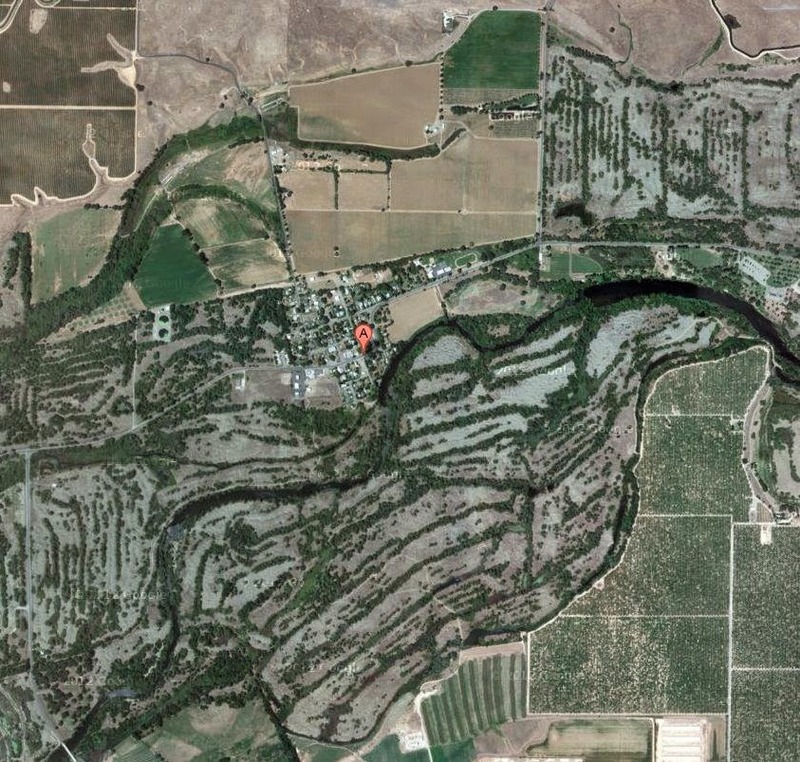 And I have “discovered” Snelling, a quiet, lovely town at the far eastern side of the Central Valley here in my home state of California, with tree-lined streets, historic Gold Rush era (1849-1860s) buildings, and a history of gravel tailings dredging of gold. And finally, the Silva Store, Eleele, Kauai, Hawaii, decades before Statehood. You couldn’t get more remote!